Entrepreneurship is like dating several people at once. Spending quality time on a marketing strategy for an upcoming feature roll-out means compromising your product analytics measurement efforts. Planning an email drip marketing strategy means less time monitoring your social media efforts. Not to forget, all the other shiny things out there that you are missing out on — the customer success meetups, the “being an entrepreneur is tough” conference or the short CodeAcademy course you have been meaning to take to improve the way you communicate with your engineering team. And in times like this, when your attention is consistently divided and you are strapped for time and resources, many important questions come to mind — like “why did I just spend a minute of my time reading her cheesy analogy comparing entrepreneurship to relationships?”, or “Is product X free to use ?.” Or if you work in the productivity space, like me, building a process management tool, Zapty, you are forced to pay further attention to menial, repetitive tasks that occupy your time , how you can automate some of your social media efforts at work, or on a personal front, become more cognizant of how busy work associated with everyday contract-based jobs ties into the final outcome of your home-improvement project. In my case, the renovation of my room 😬! I recently hired a really talented firm, Purespaces, to design the interiors for my room. 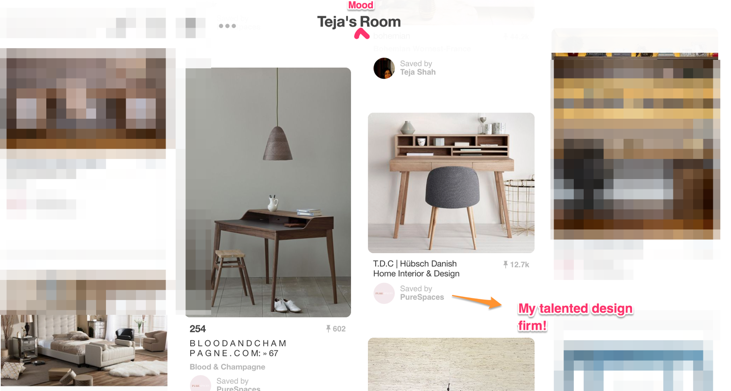 Their process is cute and simple -after spending a couple hours discussing the theme for your room, Purespaces adds you and any other stakeholders (e.g. My mom) as collaborators to a personal “mood” board on idea sharing media platform, Pinterest, where they pin ideas for your furniture and layout. Beyond that — the actual execution comes down to a bunch of emails, whatsapp confirmations and scheduling across third-party vendors — just like any other home-improvement project that involves site work. ☐ Wallpaper design? Yay or Nay? Reply to email. And amongst the bells and whistles of busy work — be it approving an idea pinned on the mood board or ensuring a worker arrived on time to complete a pending task, It can become a little blurry how these mini-tasks tie into the completion of particular furniture item — An important aspect to ensure the conclusion of a project. To understand this further, let’s look at one of the items in the above checklist. Once contractor Pete comes in to measure the bed dimensions, this task can be be checked off the list. But what does the completion of this task signify in relation to the final stage of the beds lifecycle — i.e. having it installed and ready to sleep in? Take Zapty for instance. 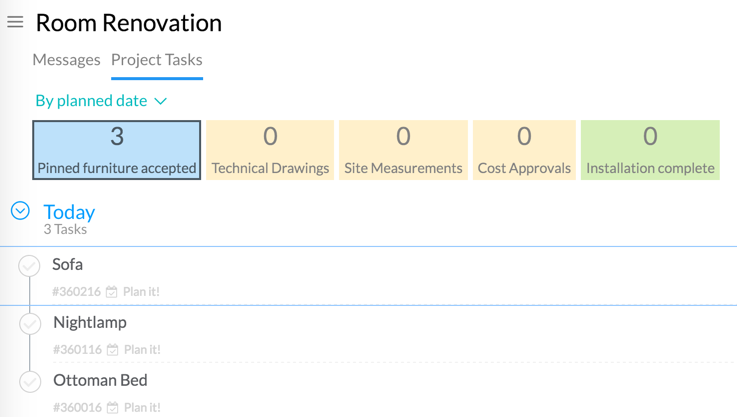 The Project management tool allows you to create a virtual Kanban (or scrum) board of sorts where you have the ability to add collaborators with guest or member access,easily add/ modify stages as you learn about your process and then collaborate across stages through mini-workflows available in the app — approvals, polls and allow the user to group the tasks through a filter that best suits the collaborator. Having everyone in the loop on the same project allows one to gauge progress, blockers and clear responsibility to move forward in the process. 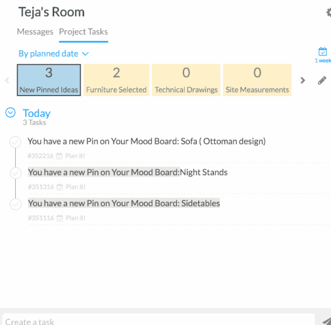 In my case, I defined each Furniture piece as a Task in a Zapty Project. Each furniture item goes through a logical sequence, right from pinning the idea on the mood board for my approval to finally installing the item in the room. This shift in operation allows one to think stage at a time rather than task at a time. 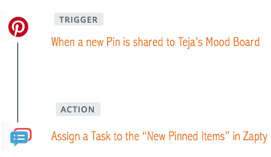 Each item discussed and accepted on Pinterest is is added as a task to the first queue in a Zapty Workflow. The first step of the process I defined earlier is kicked-off when Purespaces pins an item to our mood board on Pinterest. Once discussed and approved or rejected via pinterest’s messaging app, the rest of the workflow for approved items, goes through the process depicted in Zapty. In its current state, however, even if I have explicitly asked Pinterest to send me emails anytime a new pin is added to that particular board, I end up having to a) access pinterest to actually view the new pin and then b) collaborate on their messaging interface, and then c) explicitly upload the accepted pin into zapty to tie it into the rest of the workflow. Seems unnecessarily manual to me. 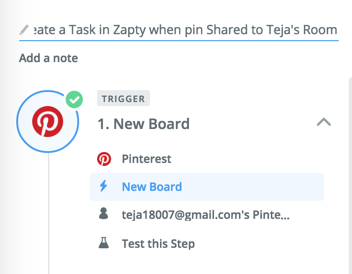 Is there a way I could automatically trigger a new task into Zapty anytime Purespaces shares a new pin to a specified board on Pinterest? And that’s where the zapier magic came in. 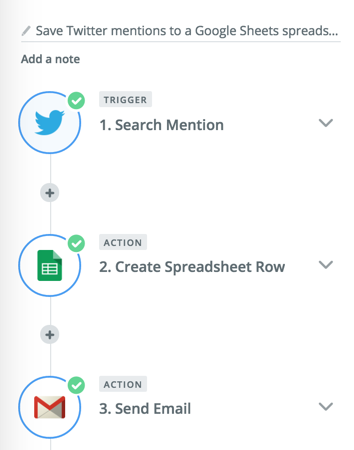 If you aren’t familiar with Zapier or are interested in automating tedious tasks without writing code or paying for a developer, I recommend jumping on that bandwagon. c) Create a task in Zapty that saves the image URL*. The Zapty integration with Zapier is still in work. When that happens, using a zap to directly create a “Task” action in Zapty upon trigger will be simple enough, till then we can workaround this be using Zapier's Email action and Zapty’s email parsing capabilities. Note: I purposely selected the Image field rather than the Link to Pinterest field so that I can directly open the image within Zapty rather than be redirected to Pinterest. Zapty’s email parser will create a task in Zapty based on #task and assign to owner. Next, Zapier asks us to specify the email address we send . In order to do this, we need to pull the email address specific to the first stage in the workflow, ie, the “Pinned furniture accepted” pile. Before that though, let’s take a step back to revise the workflow based on the new automation. Previously we reviewed the pinned furniture on Pinterest and then uploaded them into Zapty. Now that we have created a trigger for ANY item uploaded to the mood board, it makes sense to modify the name of the queue to accommodate the updated workflow. We can re-name this stage “new pinned item for review. Back to the email address. 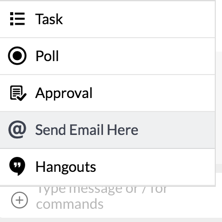 We can send emails directly to a 1:1 conversations, teams, or projects in Zapty by sending to the email address specified. And I am all set. The beauty of this workflow is I don’t have to monitor Pinterest manually all day. In fact, I don’t have to monitor it at all, because Zapier is doing the monitoring for me. a) I never have to look at Pinterest at work to evaluate a new idea that has come in. Zapier monitors that for me and adds actionable tasks into Zapty. b) These tasks are being added into an existing workflow that allows me to broadly visualize where in the process any piece of furniture is at with respect to final installation, who is responsible and where I am blocked. In addition to that, adding my interior designer along with any of her vendors as guests to this project keeps them in the loop. c) Best of all, I am not changing Purespace’s working style in anyway. Should they never have time to log into Zapty, adding tasks for them will send them/ vendors email reminders if they are blocking work from continuing. Email us at support@zapty.com if you would like to see how you can use Zapty to build out your company’s process. The biggest struggle for me when it comes to our in Social media marketing is feeling like I am pitching my product to the wrong audience or an audience who doesn’t care. At a stage where we are frugal with resources and spending, however, it can be tough to use the paid marketing options available ( Twitter ads, Facebook Ads, SEO, linkedIn groups, etc). Whether you have an online business that takes orders for your amazing baked goods, or like me, work at a workflow and project management startup, and will be launching a new feature soon, it would be great to actually recommend your product to individuals who are actually seeking you out. Twitters search gives us an easy way to do this. Essentially search for people who have a problem your product can solve, and include a link to your product or a blog that discusses their need or problem. Furthermore Twitter makes it easy to further specify location, time, or even capture sentiment through the advanced search. We include words like “recommend” or “Does anyone know” in these fields to receive better search results. For example, “Can someone recommend a store that sells cookies online? I however don’t want to manually look for these search results each time. So combining this search with Zapier automation, that saves Twitter search results to a spreadsheet, can give you quick access to a list of individual to reach out to. Furthermore, we are launching a new feature soon that we would like to gauge interest for immediately. In this case, it’s not only important for me to collect information about this user via the spreadsheet, but also immediately receive an email when the search mention occurs. So I added an additional action via Zapier’s multi-Zap capability. I am now able to address these users and ideally get contact information that will allow me to get in touch when the feature is ready to roll-out. Have you found a great workflow from an underused tool or service or even built up your own automation that might be useful to share? Would love comments below!